A blend of garlic & herbs creates traditional roast lamb in just 3 easy steps. 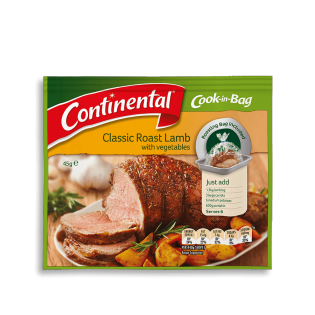 Continental's Cook in Bag is the easy way to create real flavours. Learn more. Onion, maltodextrin (from wheat, contains sulphites), sugar, wheat flour, salt, thickener (1422), garlic (3%), herbs (2%) (parsley, rosemary), flavour, sunflower oil, colour (caramel IV), food acid (citric), garlic extract, mineral salts (342, 550), herb extract. Allergens:Contains wheat and sulphites products.Made on equipment that also processes products containing milk, soybean, peanuts, sesame, egg, fish and crustacea. Step 1. MAKE IT: No need to preheat oven. On a non-heated ovenproof dish or tray, place lamb leg into bag. Add peeled and chopped carrots, potatoes and pumpkin. Season with Recipe Base. Close bag using included blue tie. Step 2. MIX IT: Support bag with your hands and gently mix to coat evenly with Recipe Base. Lie bag sideways ensuring ingredients are evenly spaced. Step 3. BAKE IT: Roast at 180°C (fan assisted 170°C) for 1 ¼ hours on lowest shelf of oven. Allow enough room for bag to expand without touching oven walls, heating elements or other shelves. Remove from oven, rest in bag for 15 minutes before serving. This proDuc is great. I have been to 5 woOlworths stores and i cant get it. Why? Is it Discontinued?